It has been seven days since I told you about the fennel ice cream I made last week, and indicated that I would be telling you about what I was going to pair it with (actually, I said “pear” it with, because I can never resist the opportunity to make people roll their eyes) within a day or two. And it’s been a week! My nerviness knows no bounds! How do you put up with this teasing? Will there be mutiny on the smittenkitchen bounty? It’s also not going to help when I stop right here. Because what else is there to say? 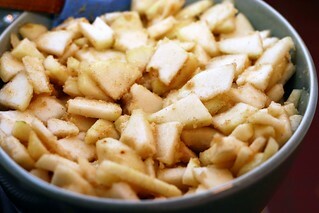 What words can I add to a dessert that could possible make it more appealing than Vanilla Brown Butter Pear Crisp? Nothing, nada. If you are swooning right now, you’d be correct. If you’re not, well, you should be. Or you would be, if you had tried it. Or leftover in the days that followed, warmed up in the microwave with a scoop of melty fennel ice cream on top. The almond kept the crispy “crispy.” The vanilla bean and brown butter made it extra-prosh. The pears always wanted to be baked, anyway. Vanilla. Brown Butter. Pear. Crisp. Eager for NYC Area Volunteers: God’s Love We Deliver is a metropolitan area non-profit which delivers free, nutritious meals to 1,600 men, women and children living with HIV/AIDS, cancer, multiple sclerosis, Alzheimer’s Disease and other life altering illnesses in NYC’s five boroughs and Hudson County, NJ. They contacted me and asked me to let my readers know that they are eagerly looking for volunteers to filling shifts in the kitchen, with both before and after-work hours, and van assistants, to help their van drivers deliver food to clients. Call (212) 294-8104 or email them at volunteer@glwd.org to volunteer. Well that’s interesting ~ I think in those terms too: “It has been seven days since Deb told me about the fennel ice cream”. You had me at brown butter, Deb. But I haven’t even made the Cranberry Caramel Tarts yet, I’m waiting until someone gives me a tart pan, and I definitely don’t have gratin dishes. Maybe I’ll just have to improvise. Deb, I have so many of your recipes bookmarked to try once I get home that I don’t know how I’m going to have time to attempt them all — and now I’ve jsut added another. oh wow… this looks just incredible. is “brown butter” just butter and brown sugar, or is that wrong? Deb, please stop! I have finals to study for, papers to write, and art projects hanging on my wall only half finished…and all you make me want to do is go into the kitchen, snap pictures, and heat up some brown butter. with pears. and vanilla. of course. also, I would be honored if you would take a look at my blog. I began it two months ago, and it’s become my little pride and joy though I’m a little shy about showing it off. Once you’ve made vanilla brown butter, take my word for it, you will never stop. When it comes to many flavors you don’t even have to brown it… verbena, rosemary, cardamon, caraway. But might I add– don’t throw away that vanilla bean. Rinse it off, dry it out until brittle and then pulse it in the dedicated “sweet” spice grinder with raw or regualr sugar and voila– vanilla sugar for another use. Wow! Just having a little browze through my favourite blogs before starting work this morning and nothing has made me drool as much as this. If only I could reach in, pick up that spoon and take several big bites for my breakfast. Beautiful photos, as always. I’ll have to try this. Thank you! Ack, I so wanted to make this on Sunday, but I just found out my Aunt is hosting my cousin’s birthday party that day. So it will be cake instead. How did I miss this recipe in Gourmet? Browned butter is my new best friend– it can add so much depth to any baked good, I wish I could put it in everything. The residude in the bottom of the pan looks absolutely incredible. Nice combination of pears and almonds too. This sounds like the perfect recipe for all of those Harry and David pears I’ll get at Christmas time!! Yum! That looks delicious! I am absolutely making it this weekend! YES PLEASE! You do deliver right? :: whimper :: How’d I miss this recipe? Clearly, the early-morning commute clouded my eyes. Apple crisp has always been my favorite dessert, but I think this one might just win in a crisp cage match. I got pears a few days ago! It’s on! The only thing I don’t have is pear brandy but I hope/think that shouldn’t make the biggest difference since I haven’t had the real thing already. Thank you. I have only had Apple Crisp, which I love, so I am very excited…..I am a “double the crisp” in the recipe kind of gal but I have more faith in Gourmet than most sources so I’ll stick to this recipe as closely as I can. Debs coming over to MY LOFT tomorrow night and she’s bringing cookies and latkes! nah nah nah nah nah nah. Ha ha!! I’m so lucky!! Thank you! I now have a use for the 5lbs of almonds my friend sent me besides snacking on them. She wasn’t able to get me blanched whole almonds. 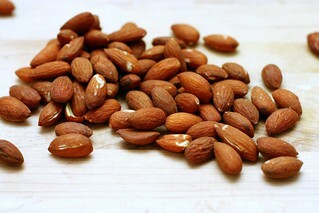 Do you know that you can get carpel tunnel syndrome or repetitive stress injury from popping almonds out of their skins? Do you think I could put in Marsala wine instead of Brandy? Joc…I’m jealous. Oh, so, jealous. 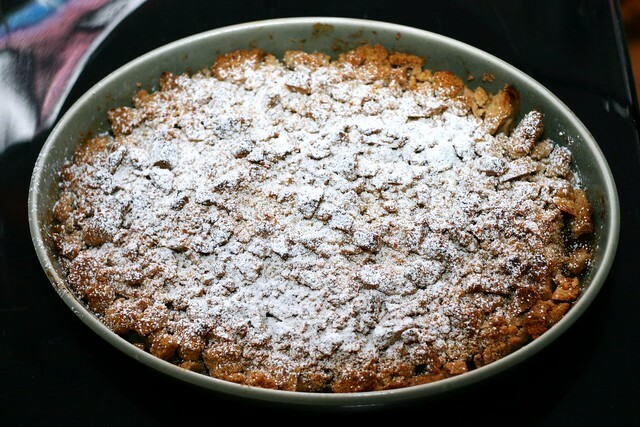 I love including almond (or hazelnut) with my crumble topping. I usually just default to ‘apple’ but this makes me think outside of the apple box – pears with vanilla are so wonderful, and it can only be enhanced by some fabulous crumble on top. TOTALLY making this for our annual holiday dinner with family friends. Should be the perfect finish to the SIX COURSE blow-out we are planning. We’re insane. OMG! I made this tonight. I have had the giggles for the past few hours…sweet sweet heaven. The aroma in the house is just redonk! I peared up my pear crisp with some homemade vanilla cardamom ice cream. Tee hee…. THANK YOU FOR SHARING this amazing recipe. I look forward to making this again when I have guests. Nicole — Sorry I missed your question! I think you could skip the almonds, but swap the powdered almonds with the same amount of additional flour. This looks like a really comfy and homey dessert. I love the way that pears and almonds work together. I used that same combination in a pear, almond and honey tart that I made a few weeks ago. Mine didn’t have that scrumptious looking crunchy topping, though….. I did end up making this and it was great. I think I should’ve pulsed the almonds by themselves first to make sure they were really thin cause mine was a little too chunky. But tasted great. Some of my topping burnt just a little but I would make this over and over again. :D Eventually, I will perfect this. I was salivating the second I read this recipe, but I took a while to get around to making it… Anyway, it turned out marvelously–very rich, sweet, and gooey. However, I couldn’t help wanting a tangier taste than the pears provided. They almost seemed overly-sweet to me. I might try this recipe next time with green apples instead. If so, I’ll let you know how it turns out! Yes, i agree with Bethany: a tangier something seemed like it would have been a good thing in this. That being said, i made it last night, and it was seriously heavenly. i am only cooking for two, and halving the recipe seemed like too little, so i two-thirded it. Bizarre, i know. But everything worked out! i baked it in a 9×13 glass pan, which worked fine. Didn’t have pear brandy (sob!) so i added a touch of red wine instead. Also, couldn’t help but add just a bit of spice: cardamom, cinnamon, nutmeg. May reduce the sugar next time and use unsalted butter- i always forget ;) Added some whipped cream on top, just because, but realized that ice cream would have been much better. All in all, this is an ace recipe; the crumb topping was absolutely perfect and who doesn’t love to use a vanilla bean? Thanks, Deb! If I don’t have a food processor, do I just chop the nuts till the are very fine? or could I use/buy sliced almonds?? You should chop them until they are very finely ground, or buy ground nuts. This is very nice. Although, next time I will use somewhat less sugar. When I first tasted it, it was way too sweet for me, but then I thought I would add a bit of sour cream on top, and it really worked. It was sooo much more delicious with sour cream that I really recommend serving this with sour cream on top. As for grinding nuts without a food processor, I would recommend putting the nuts into some strong plastic bag, maybe covering the bag with a kitchen towel and then smashing it with a hammer (or with that thing you use for flattening meat slices that I don’t know an English name for) till you reach the desired consistency. Has anyone made this in a larger pan? I want to make it for our group Thanksgiving dinner and separate dishes would not work out very well! I would also like to make it in a larger pan. Any suggestions. Also, how ripe or not ripe should the pears be? I made it in one large pan (I realize in hindsight this may not be clear) — it was a large, deep oval dish, about equivalent in volume to a 9×13 pan. I baked it for almost an hour. The recipe suggests that the pears should be “firm-ripe”. both times i’ve made this, the topping starts to burn before the filling bubbles, and i end up covering it with foil to save the crisp from certain doom. why does this happen? is it just me? Ok so I have cows and I make my own butter and I live in India where we don’t get butter in sticks ever…so I was wondering how many gms or oz is a stick of butter? I can’t wait to make this…my mum just gifted me an entire bag of beautiful vanilla pods from Kerala and it’s the season for pears and I just got a huge bag of them from an orchard in Simla so this is just crying out to be made in my kitchen today! Hi Deb – can you get away without the brandy and mix it with other fruits? This looks amazing and I can’t wait to try it! You specify Anjou or Bartlett, but do you know if Bosc would work? That’s all I have on hand. Are they all very different from each other? I didn’t have almonds on hand, so I used hazelnuts and walnuts in the topping. Yum! Just made this last night, the flavors were so heavenly and I am definitely making this again! The filling was perfect, but like Lana the topping started to burn before the filling had bubbled up– might have been the different sized (16 oz) ramekins I used? Well anyway, thank you so much for posting and sharing this! Wow, this looks so incredible and will put the extra pears I have to perfect use! thank you for the delish recipes! I just took this out of the oven and the house smells wonderful. It’s my first try at brown butter and I can’t wait for it to cool down so I can dig in! I used 9 medium-sized pears, and there was plenty of topping to go ’round in a 9×13 pan. Deb. I made this on Tuesday night and everyone thought they had died and gone to delicious brown vanilla butter heaven. Just had to tell you what a great success it was. I’m pretty sure I’m going to have a revolt on my hands if I don’t make it again soon! Thanks for another great recipe! I’m making this now, and the apartment smells heavenly. I’m wondering, though – is could I substitute something non-alcoholic for the brandy? My mom would love this recipe to bits, but alcohol in any form (even in small amounts, cooked or baked!) gives her migraines. Would more butter suffice? Or another liquid? Hi Julia — You can just skip it. I made this with apples and spelt flour – it was a major success! Thanks for the great recipe, Deb. It’s definitely a keeper. Deb, did you possibly use more butter when you made this? The topping, to me, doesn’t seem quite right.. it’s a bit floury. The crisp is still delicious, but I would adjust the topping for next time. that looks really fantastic! I love the way you make the photos, because its an art to make such great photos of the meals! Lovely site with great tipps, i will recommend it! Just made this as a dinnerparty dessert in little ramekins and served it with vanilla ice cream – it was heaven! What would you estimate as the cooking time in something like a 9×9 glass pan? Landed on this recipe after I stumbled upon marked-down, use-them-NOW pears – and then I didn’t use them soon enough, so I augmented what I could salvage with cherries (bought cheap, pitted, frozen), cranberries (dried, but simmered, then tinged with orange extract), and raspberries (a buck a punnet!). I think the topping does need more butter, but the overall flavor of it was comforting and rich. (I did toast the almonds before I pulverized them with the dry ingredients.) I’d never thought to add that much butter – much less browned butter – to a fruit crisp, and it’s an idea I’ll carry forward to some fruit mixes. First, though, I want to give it another shot with pears! Made this a couple of days ago. It’s delicious! I had a little trouble with the crumbs though. Mine ended up looking like sand, not chunky crumbles. I did an internet search and found that the solution was to add more melted butter, a tablespoon at a time, and pulse after each addition until the crumbs get to the consistency you like. It took 3 – 4 additional tablespoons of butter for my crumbs to turn into true crumbs. I will definitely make this again.